The Peugeot 308 is a small family car produced by the French car manufacturer Peugeot. It was unveiled on 5 June 2007, and launched in September 2007. Its development code was "Project T7", and is the first car of the X08 generation of Peugeot models. The 308 features a range of petrol and diesel engine options. In March 2011, the 308 received a facelift, and it premiered at the Geneva Motor Show. A second generation was unveiled in 2013, and it was awarded as the 2014 European Car of the Year. Launched as the replacement for the Peugeot 307 in most international markets, the new vehicle was based upon the old 307's chassis, but has new bodywork and is slightly longer and wider. Its coefficient of drag is 0.29, and it has a five star Euro NCAP rating. Following the facelift of 2011, the drag factor was reduced to 0.28. The 308 HDi holds the Guinness world record of the most fuel efficient mainstream car currently in production, having averaged 3.13 litres per 100 kilometres (90 mpg‑imp; 75 mpg‑US) over a distance of 14,580 km (9,060 mi), but Peugeot ran foul of British advertising rules by claiming 126 mpg‑imp (2.24 L/100 km; 105 mpg‑US) in an advert for the car. The 308 is manufactured in France at the Mulhouse and Sochaux factories. It is also manufactured in Kaluga, Russia, for the local market, since 2010, and El Palomar, Argentina, for the South American market since 2012. The 307 remains in production for several countries, especially those that prefer saloon bodies, such as China. The 308 was available as a five door hatchback, with a three door limited to a few markets. In May 2010, Peugeot announced the return of a GTI model (known as the GT in the United Kingdom), featuring a turbocharged 1.6 L engine with 200 bhp (149 kW; 203 PS). A station wagon concept version of the 308, the Peugeot 308 SW Prologue, was also unveiled at the 2007 Frankfurt Motor Show. The production version was shown at the 78th International Geneva Motor Show in March 2008, and went on sale that summer. The 308 SW (or 308 Touring in Australia) was available in a 5 or 7 seat versions. A further variation of the X08 chassis used by the 308 is an SUV or an MPV, named 3008. A cabriolet with a retractable hardtop known as the 308 CC replaced the Peugeot 307 CC in the spring of 2009. The roof folds into the boot in 20 seconds, and at up to speeds of 7.5 mph (12.1 km/h). With the roof up the boot space capacity is 465 litres but this reduces to 266 litres with the roof down. 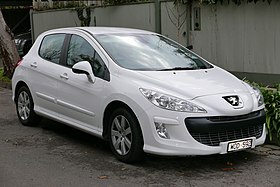 In September 2011, Peugeot presented, for the Chinese market, a four door sedan version of the 308. This version produced for the Chinese market by Dongfeng is based on 308 facelift but differs from the European Model, with large front grille, more chrome on the hips and different shape of the LED tail lights. The interior is identical to the European model. The engine range includes two petrol 1.6 16V 110 hp and 143 hp 2.0 16V. The trunk has a volume of 502 liters. The Peugeot 308 sedan, sold at 160.000 units in three years, joins the Peugeot 408 in China, a C segment car with a slightly higher price. A facelifted 308 was released in May 2011, following the public launch at the 2011 Geneva Motor Show, with a new front end and minor changes to the rear of the vehicle. Peugeot also launched the 308 e-HDI micro-hybrid model with stop start technology, a system to recover energy during deceleration and a hybrid battery that delivers additional energy on start up. A full hybrid 3008 was also announced at the same time. The version produced in South America is assembled with this facelift. The facelift was also given to the 308 SW and 308 CC. As the EMP2 platform is not exported to South America, the first generation 308 is still marketed there and receives a second 308 II restyling in 2015 . The front bumper is inspired by the 308 II (reduced front lights, Peugeot logo and text, anti fog lights, less contoured hood ...). The interior undergoes some modifications to accommodate some elements of the 308 II. There is a touch screen perfectly integrated in the center console, instead of the traditional CD / MP3 and empty pockets. Bosch announced in 2007 that it is supplying hybrid diesel-electric technology to Peugeot for the 308. A prototype 308 equipped with this technology was displayed in the Frankfurt Motor Show of 2007, and a further 'Prologue' concept car was shown at the 2008 Paris Motor Show, featuring a 1.6 litre HDi engine to turn the front wheels, and an electric motor to turn the rears. Peugeot presented a 2+2 coupé concept car development of the 308, the 308 RCZ, at the 2007 Frankfurt Motor Show. This coupé concept is 18 mm lower than the standard car. It has similar proportions to the Audi TT. The final production model was unveiled at the 2009 Frankfurt Motor Show as the RCZ without the 308 name, and went on sale in the spring of 2010. In November 2007, the 308 was awarded the Goldene Lenkrad (Golden Steering Wheel) in Germany. A panel of automotive professionals chose the 308 as the best compact family car after it finished first in nine of the 15 criteria. The second generation 308 was displayed in Autumn 2013, with updated style along with the 508 and the 208. Peugeot changed its numbering system where the final digit is fixed: 8 for the mainstream range, and 1 for the models aimed at emerging countries, such as the Peugeot 301. It is built on the PSA EMP2 platform, shared with Citroën C4 Picasso, resulting in 140kg weight loss compared to previous generation. The changes included daytime running lights/DRL at the bottom and the blinker (turn signal indicator) is on the daytime light, advising the pedestrian or other road user to which direction it is moving. Groupe PSA announced that the following models; Peugeot 308 1.2L Puretech 82ps MT5, 1.2L PureTech 130 MT6, Peugeot 308 SW 1.5L BlueHDi 130 MT6 and two other Peugeot & Citroen models are compliant to WLTP Euro 6D Temp regulations up to 2020 RDE Conformity factory of 1.5 x regulated limited in real world driving emissions for NOx and PN. The Peugeot 308 GTI by Peugeot Sport featured engines producing 250 hp (186 kW) and 270 hp (201 kW). The 250 hp version had full LED headlights, an electronic limited slip differential, 18" alloys, keyless entry, stop/start technology, 11 mm lowered ride height, a coloured reversing camera and twin exhausts. Additionally, the 270 hp version gets 380 mm Alcon front brakes, massaging leather/Alcantara bucket seats, a torsen limited slip differential and 19" lightweight alloy wheels. In March 2014, the Peugeot 308 was awarded European Car of the Year, in competition with the BMW i3 and Tesla Model S. The Peugeot 308 was also voted Car of the Year Auto Europa in Italy, by the Italian automotive journalists association, Car of the Year in Switzerland by Schweizer Illustrierte, and four other magazines. 2017 Update (T9) The features include a new bonnet and front bumper design and indicators that scroll, and a new designed grille that feature the famous Peugeot Lion. All models, except Active and GTi, feature the Panoramic roof. New DRLs are matched at the back with the LED Claws lit permanently when the vehicle is running. A new more powerful 1.5HDi engine with 130 bhp joined the line up from September 2017. All models have TomTom satellite navigation as standard in addition to the central touchscreen update. 2011 201,929 203,998 Total production reaches 1,072,551 units. 2012 179,200 184,300 Total production reaches 1,251,700 units. ^ "308: dynamic, stylish contours and materials". Peugeot. Retrieved 2011-05-05. 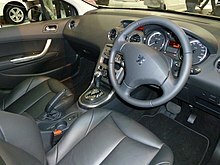 ^ "Peugeot-Citroën-Mitsubishi: parte la produzione nella nuova fabbrica in Russia". autoblog.it (in Italian). 2010-04-24. Retrieved 2010-11-11. ^ "Peugeot 308". autocar.co.uk. Retrieved 2007-11-17. ^ "Peugeot press release March 2011" (PDF). Retrieved 2011-03-13. ^ Mark Sweney (2009-10-07). "The Guardian 7 October 2009". London: Guardian. Retrieved 2011-03-13. ^ "PSA Press Release". Psa-peugeot-citroen.com. Archived from the original on 2011-06-28. Retrieved 2011-03-13. ^ "RIA Novosti 26 March 2010". En.rian.ru. 2010-03-26. Retrieved 2011-03-13. ^ "Top Gear 24 May 2010". Topgear.com. 2010-05-24. Retrieved 2011-03-13. ^ "Independent Online (South Africa) 11 March 2011". Iol.co.za. 2010-06-11. Retrieved 2011-03-13. ^ "Auto Express February 2009". Autoexpress.co.uk. 2009-02-18. Retrieved 2011-03-13. ^ por Enrique GarcĂa de 16 de Sep del 2011 (2011-09-16). "Peugeot 308 sedan". Es.autoblog.com. Archived from the original on 2012-03-27. Retrieved 2011-11-08. ^ "Bosch says it has contract for diesel-hybrid parts". autonews.com. 2007-06-12. Retrieved 2010-11-11. ^ "Auto Express February 2009". Autoexpress.co.uk. 2009-04-20. Retrieved 2011-03-13. ^ "The 308 awarded the Golden Steering Wheel". Car news and reviews. Vcars.co.uk. 2008-03-26. Retrieved 4 April 2013. ^ Jim Holder (24 May 2012). "Peugeot revamps naming structure". Autocar. Retrieved 10 February 2018. ^ "The new Peugeot 308:A refined design and an innovative cockpit for unique driving sensations". Peugeot Media Center. 13 May 2013. Retrieved 10 February 2018. ^ "Following on from the real-world fuel economy measurements, the protocol developed by Groupe PSA, T&E, FNE and Bureau Veritas has been adapted to measure NOx and particulate emissions in real driving conditions". ^ "Groupe PSA discloses vehicle emissions real driving". 2018-03-06. ^ Mann, Richard. "New Peugeot 308 wins European Car of the Year 2014". Charters. Archived from the original on 2014-03-04. Retrieved 2014-03-03. ^ "Peugeot 308, Car of the year 2015 in Italy". Union Italiana Giornalisti Automobile dell'Automotive. Archived from the original on 2014-11-09. Retrieved 2014-12-20. ^ "Peugeot 308 : Das "Schweizer Auto des Jahres"". Charters. 2013-12-06. Retrieved 2014-12-20. ^ a b c "PSA". Psa-peugeot-citroen.com. 2010-06-30. Archived from the original on 2010-12-06. Retrieved 2010-11-11. 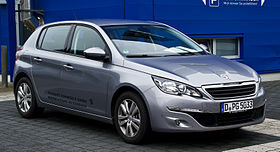 Wikimedia Commons has media related to Peugeot 308.